The 32-year-old Kryukov is training in Italy at the moment, but the Russian is in a strange kind of limbo for an athlete at the top of his game — he doesn’t know if he’ll ever be able to compete again. That’s because he’s been banned for life and stripped of the silver medal he won at Sochi four years ago for doping violations. But he keeps training because it’s what he’s used to doing — it’s what he’s done all his life. “Nothing is clear, I have no idea of what to prepare for. Even my coach, he is writing my training plan, but he doesn’t know which races we should prepare for,” Kryukov told CNN in Milan, near where he trains. But there is a small glimmer of hope for Kryukov. The Court of Arbitration for Sport in Lausanne, Switzerland, will hear his appeal on Monday. If he wins his appeal, Kryukov will be allowed to compete in the Winter Olympics next month. Sport’s final court of appeals is likely to be very busy next week. Of the 43 Russian athletes banned for life by the International Olympic Committee for doping violations during the 2014 Sochi Winter Olympic Games 42 have filed appeals to the CAS. The entire Russian Olympic Committee was suspended from the Games, after investigations by two commissions confirmed widespread doping by Russian athletes at Sochi — which Russia denies. So any Russian athlete cleared to compete in the upcoming Winter Games in Pyeongchang, South Korea, will have to do so representing “Olympic Athletes from Russia” — with no use of the Russian flag or national anthem permitted. They will also have to prove they are clean to the IOC before they will be allowed to compete under a neutral flag. “I hope this will be a fair hearing, and they will listen to not only my words, but to the facts that we will provide them, because there is no information and proof that I am guilty,” said Kryukov. Back in Moscow, Olga Zaytseva’s fondly looks at her Olympic medals, which have pride of place in her home in the Russian capital. 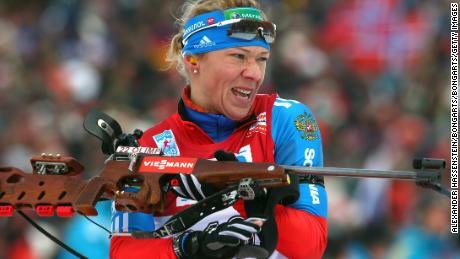 Zaytseva, one of Russia’s greatest biathletes, until she was found guilty of doping violations by the IOC in December, won gold in relay races in the 2006 Turin Games and 2010 Vancouver Games. “This medal is more valuable and precious to me because the Games were in my homeland,” she points to the silver she also won in 2014. Her medals hang alongside a framed photograph of her with President Putin at the Sochi Games. “I’ve never doped, I’m against doping,” she adds. Zaytseva retired from the sport in 2015, but she is appealing in the hope of keeping that 2014 medal and also to protect her legacy. “For me it’s very important to prove it and I’m doing everything possible to prove that I was a clean athlete. And that all my results were achieved with me being clean,” she says. Many of the athletes appealing say they are part of a “collective punishment” against Russia, which historically has been an Olympic superpower, both at the Summer and Winter Games. “In my opinion, this evidence is fabricated and it comes out of nowhere. I think these are some people’s fantasies, and I don’t know why they believe them. These accusations are unreal, and I can’t comprehend them, they’re baseless,’ says Zaytseva. Those 42 Russian athletes are likely to have a tough fight on their hands in Lausanne. Russian whistleblower Grigory Rodchenkov will testify against the athletes, even though his life is under “serious threat”, his lawyer Jim Walden tells CNN from his office in New York. Rodchenkov was the head of the Sochi lab during the 2014 games, and he has detailed epic “systematic manipulation” to swap drug-tainted urine samples for clean ones, though Russia has consistently denied the allegations of a state-backed doping program. “We have heard the ‘I’m clean, I’m clean, I’ve been tested a hundred times’ so many times in the history of doping,” said Walden, who places a lot of the blame on the Russian state. Canadian lawyer Richard McLaren will also testify. His report for the World Anti-Doping Agency laid bare a system that allowed more than a 1,000 athletes to cheat, despite the repeated Russia denials. McLaren says they have more than enough evidence — that of Rodchenkov as well as their own findings — to back up the Russian doctor’s conclusions and dismisses claims by the athletes that their samples were tampered with. “We checked the DNA and the DNA is consistent with their DNA,’ McLaren told CNN from his home in London, Ontario. Meanwhile, Zaytseva fights on, determined to clear her name for the sake of her children. As for Kryukov, he hopes for a return to the glory of the Olympic stage and reclaim his status as Russia’s golden boy. He will appear in court on January 25 to plead his case. A decision is expected on or before January 31 — less than two weeks before the opening ceremonies in Pyeongchang.